A conference will be held on the role of investment in rebuilding Benghazi in November (BCCI). 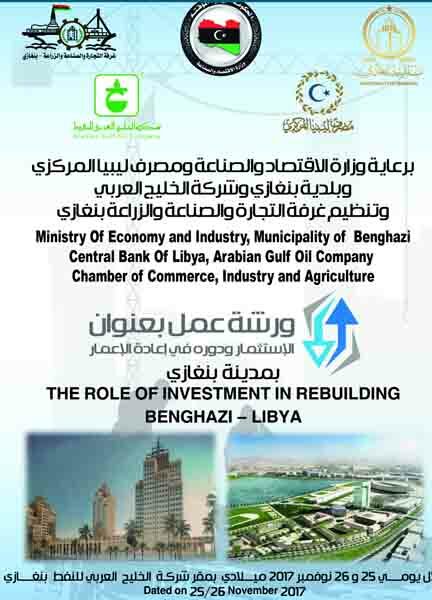 A conference on the ‘‘role of investment in rebuilding Benghazi’’ will be held on 25-26 November 2017 in Libya’s second largest city. The conference is sponsored by the Ministry of Economy, the Municipality of Benghazi, the Benghazi Chamber of Commerce (BCCI) and the Arab Gulf Oil Company. The organizers say that the conference will cover topics of how to attract local and international topics, looking beyond state investment, encouraging private sector investment, encouraging a variety of funding methods beyond those used traditionally in Libya, encouraging long term investments, and a review of the legal environment for investments as well as other topics.